The following is an extract of the full review to appear in Film For The Collector and Ace Magazine. 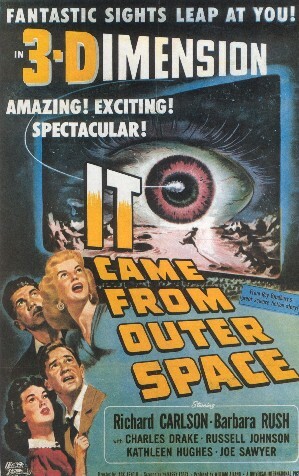 The 3D science fiction classic from 1953 originally released by Universal 8 is now back on the market as a re-release from Derann. And given the way second hand copies of this film are snapped up for vast sums of money this could be an astute move by those boys from Dudley. When a huge asteroid streaks across the sky and crashes to earth John Putnam (played by Richard Carlson), his fiancé Ellen Fields (Barbara Rush) and helicopter pilot take a ride to investigate the crash site. Putnam ventures down into the crater to find a strange spherical craft with an open hatch. This closes just before an avalanche hides the craft from prying human eyes. Local people start to vanish and Putnam becomes suspicious as to what is actually going on when two reappear under the apparent control of the aliens. When Putnam confronts them the pair ask for his trust and advise that they only need time – they do not intend to harm anyone. These aliens seem alright and not at all like the usual lot we get invading our planet. Putnam agrees that he will go along with them. However, others do not trust them and when Ellen is taken a vengeful mob is formed. The aliens are prepared to destroy themselves and their interstellar ship rather than have it fall into the wrong hands and it rests on Putnams shoulders to stop the mob and save the day. This film originally utilized the Polaroid method of 3D projection when originally released and this was widely considered to be the preferred choice prior to the introduction of LCD glasses which can be now enjoyed at Imax cinemas around the world. When re-released in the 70’s to take advantage of the resurgence of interest in 3D the anaglyph process was used not only to save money but to make it available to all cinemas who merely needed to purchase the relevant red/green glasses. Some films receiving this treatment fared better than others and ‘It Came From Outer Space’ is one of those in the better category. The most important thing to note is this film requires the red filter over the right eye, which is contrary to the norm. It is also worth making sure the projected image has a black border all the way around to maximize the effect. Once you have all this in place start this film. Each person sees 3D in a different way and I expect some will find it more impressive than others. From my perspective the opening titles and helicopter ride were not particularly impressive. However, once the opening minute or so was over the picture became a deep part of the room with detail appearing to go either beyond the screen or out in front as intended. During the avalanche scene one flying rock really did make me jump such was the surprise of the thing flying out into the room. The more simple scenes are the ones I found most impressive; amongst these I could single out when the main character is in the Sheriff’s office on the telephone. Every detail is sharp and the depth to the room is unmistakable. The print is fine. A title providing great fun and something you will not tire of seeing. It therefore comes highly recommended.